MACON, Ill. –Macon Speedway teamed up with Casey’s General Store for reduced mission to the legendary fifth-mile high banked oval, and there’s also a drawing at each participating Decatur area Casey’s General Stores for two free tickets to Casey’s General Stores/Armed Forces Night on May 31. At participating stores, vouchers for $2 off general admission are available at the front counter, and each store is holding a drawing for the two free tickets. 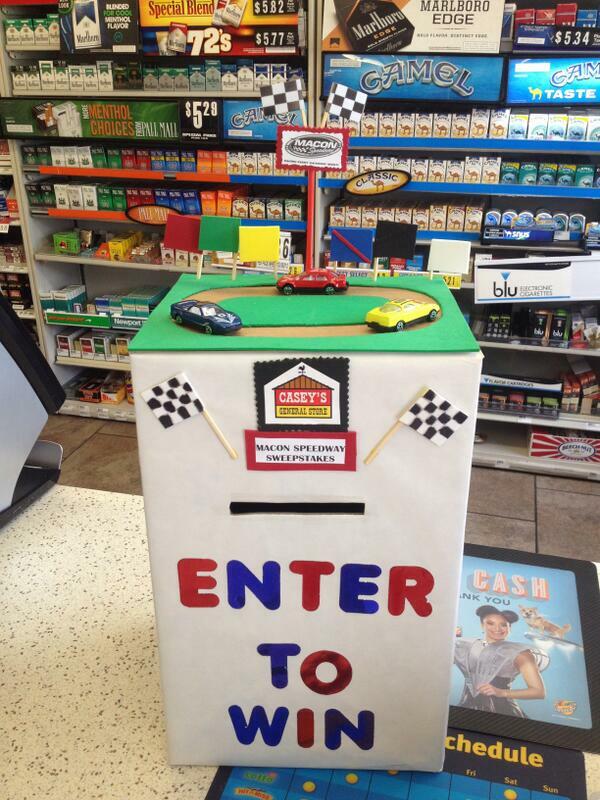 The fun already began, so check out how they decorated the entry box at your favorite Decatur area Casey’s. Casey’s will remind Macon Speedway race fans the convenience store is the nation’s fifth-largest pizza chain when Pepperoni Pete makes an appearance at the track. Casey’s personnel will also help race fans spin the lucky wheel for prizes, including gift cards. In conjunction with Armed Forces Night, Casey’s personnel will also raise money for Hope For The Warriors, whose mission is to enhance the quality of life for post-9/11 service members, their families, and families of the fallen who have sustained physical and psychological wounds in the line of duty. Hope For The Warriors is dedicated to restoring a sense of self, restoring the family unit and restoring hope for our service members and our military families. Also, military personnel with an ID receive half-price admission, and military in uniform are admitted free. Billingsley Towing Modifieds, Street Stocks, Sportsman, Outlaw Hornets, Stock Hornets and the Illinois Lightning Sprint Series will run the Macon Speedway oval. Gates open at 5 p.m., and racing starts at 7. For more information, follow Macon Speedway at (www.maconracing.com), Facebook (www.facebook.com/maconracing) and Twitter (@maconspeedway). It’s easy to join the Macon Speedway text service. Fans can text MSFANS to 74574 to receive fan information. Drivers text MSDRIVERS to 74574 to receive driver information. Message and data rates may apply. Updates are also available by calling Macon Speedway at 217-764-3000. Macon Speedway is located nine miles south of Decatur on U.S. 51, then 0.6 miles west on Andrews Street and south to 205 N. Wiles. Macon Speedway hosts racing every Saturday night, plus many weeknight specials.